Should I take a drink because Jay quoted Rocketeer? You should pour one out for the fact that the greatest superhero flick of all time was a devastating commercial failure. Please tell me that at some point, possibly in PAD’s run, there is a discussion about Alex having a chronic BO problem, just so they can keep talk about “reeking Havok”. 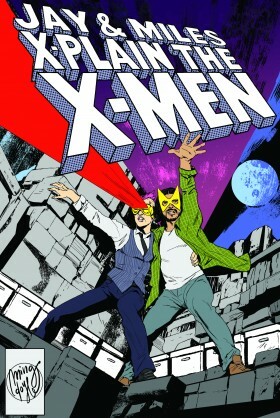 Oh, and just to note that David Wynne is KILLING it with his episode cover pieces for this crossover! RE: PAD and “reeking Havok”. It is not inside of his initial X-Factor run, and I don’t believe he ever writes Alex in X-Factor after that. Yes, he is. While I disagree that Hodge ever looked creepy during X-Tinction Agenda, David Wynne’s episode picture for this episode is disconcerting. Actually PAD gets to write Alex a bit more. He turns up in X-Factor’s Investigation years (Volume 3, I think, technically) after he, Lorna and Rachel come back from dealing with Vulcan in space, and Alex briefly leads the team while Madrox is dead. He then breaks up with Polaris and leaves to go lead the Avengers Unity Squad. Ugh. I wish he’d stayed. Mr David THEN gets to write Alex just a LITTLE more during All-New X-Factor (which would be Volume 4, I guess) as Havok uses Quicksilver to spy on Lorna for him (remember, at this point, he and Polaris were technically half-brother and sister). So Pietro goes and talks to Alex from time to time to fill him in on things, meaning they get to share a few scenes in bars playing pool, which is cool. I still don’t think there’s a “reeking Havok” joke in there, sadly. I’m trying to think who would most make that joke. I’m not as familiar with David’s X-Factor era (I understand this is a failing of mine), but I could totally see Bobby saying it at some point in a hypothetical crossover. I remember this crossover started the whole “too many characters in one comics” for me, and thus much less effective then it should’v been. Still better from most of the crossover that came later though. The fact that Archangel didn’t have any meaningful arc in this, knowing what this villiain means for him, totally bummed me off. But you do manage to throw the light on whatever worked and was good in this story. It’s funny you mention Archangel not really having meaningful interaction with Hodge. I only read the last two X-Factor issues and none of the New Mutants issues when this came out. Uncanny X-Men gives us little indication that Hodge had any real history with any of these characters. He just came across as the mutant hater in charge of Genosha. You have no idea how happy I was to hear the score from ending of Empire Strikes Back because oddly enough when I was getting into X-Men about 14 years ago that was the one CD that I always listened to. The Cloud City theme from Empire will always be associated with both the Morlocks Mister Sinister and Han and Leia’s love theme will always be Scott and Jean’s. Didn’t the whole “Wolverine gets turned into an evil assassin by the Hand” thing kinda end up playing out in Enemy of the State? Yeah, although it’s pretty close to an ironclad law of physics that Chris Claremont’s version of that story would’ve been better than Mark Millar’s. Likewise, Death of Wolverine seems to play out the same sort of arc that he envisioned for the run-up to X-Men vol. 2 #3. Was there a production problem with the audio for this episode? Miles was very quiet compared to Jay, to the point where I was having to repeatedly adjust the volume as they bantered back and forth (I finally wound up just living with loud Jay). It’s not an uncommon problem for many podcasts I listen to, but it is an uncommon problem for this one, so, I ask. Weird – I didn’t notice that when I proofed the episode. I’ll check on it, but – what app / site / etc. are you using to listen to the episode? I’ve tried in a few places, but I haven’t been able to reproduce the issue. I don’t have access to an Android device to try Podcast Addict, though – maybe it’s an issue with that app, or maybe with the audio balance of your audio setup since Jay and I have different pitches to our voices? I wish I could help more, but thank you for letting us know, and I’ll keep poking at it! Thanks for looking into it. I’ve listened to probably 40-60 episodes on exactly this setup, and have never had it happen before. I didn’t have any problem. It might be in the software you’re using. Which strikes me as odd, because it’s the software I always use. Nothing’s changed, and this morning I had a problem. Can’t say I noticed an issue either. I have to agree with Miles that I never bought into the Wolverine/Jean Grey thing, at least not early on. The idea of the best there is at what he does pining longingly after one of the strangest teens of all — who was FINALLY committed to her teen sweetheart — rang false to me. I get a Wolverine crush — we’ve all had a crush on a 20-year-old redhead (I married mine) but the reciprocity always rang false to me. Speaking of Wolverine… the whole “Wolverine is dying thing” is an example of good continuity … Wolverine has not been top notch since his crucification. There were a few issues of “Alpha Flight” at roughly this same time where he went to Canada to say goodbye to Heather because he figured he was dying. Not a great time in Alpha’s history but still a nice touch. Also where Alpha Flight find out the X-Men are still alive after Fall of the Mutants, for the record. I loved the penciler/inker/colorist conversation at the end. Made me think of the famous scene in “Chasing Amy” (tracer!) but a good inker can make or break a penciler and even vastly change their style. One example is John Byrne self-inking on “Fantastic Four,” “Alpha Flight” and “Avengers West Coast” vs being inked by Terry Austin on the classic “X-Men” run … yeah you can make out the recognizable “Byrne faces” but stylistically it’s very different. My favorite example though is Kirby. If you look at old “Thor” issues there is a vast difference between the thick lines of Chic Stone’s inks to the rather sketchier but more subtle lines of Vince Colletta. In fact if you look at later “Thor,” when Keith Pollard is drawing the book during both the Thomas era and the Gruenwald/Macchio/Moench era, Pollard’s work looks VERY Kirby-ish thanks to inks by Chic Stone. Miles btw — thanks for responding to my Thor tweet recently, looking forward to your new podcast. I love Elle’s take as far as movies go, but I’d really love to see X-Men as a TV show, since it’d allow the soapiness to shine in all its sudsy glory. I’d honestly actually prefer something that takes certain ideas from the comics but plays a lot with it to create something new. Like, one of the things I’ve enjoyed so much about the CW shows is that it’s not just adapting an existing story or even typical character beats. Green Arrow’s arch-enemy is Deathstroke? Cool, why not? And we’re gonna make teh ultimate ship between him and a character tangentially inspired by Firestorm’s stepmom. Sure. Oh, and Flash’s bff’s are Killer Frost and Vibe, but they’re not gonna have those identities for a while. As for the actual podcast episode, stellar as always. And as last week’s comment said, yes, I thought of the Mighty Monarch too. It’s obvious to me that Hodge doesn’t skitter from place to place. Instead, he rides around on a Royalton Industries Segway to get from place to place. it’s not the metaphor that’s being described as literal. It’s the poetry. So Psylock is *figuratively* poetry in motion, but the particular poetry she’s being compared to within the metaphor is itself literal.